East Pool Mine (later known as East Pool and Agar mine), is located in the Camborne and Redruth mining area, just east of the village of Pool in Cornwall. Worked from the early 18th century until 1945, first for copper and later tin, it was very profitable for much of its life. 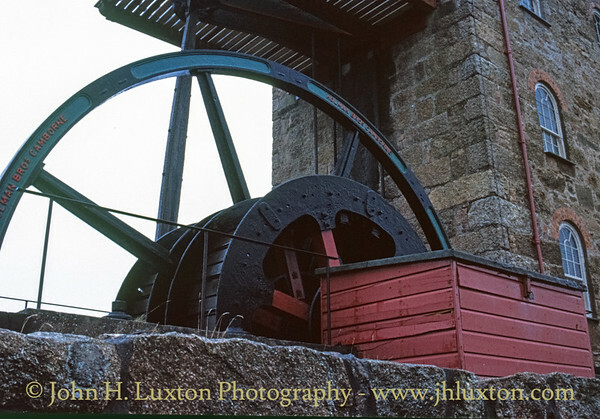 Today the site has two preserved beam engines and is part of the Cornwall and West Devon Mining Landscape World Heritage Site. East Pool mine started out in the early 18th century as a copper mine called "Pool Old Bal". The land under which it was allowed to mine (the "sett") was leased from the Basset family and it generated enough money for that family to build their country house at Tehidy. The mine restarted as East Pool mine in 1834. On its north was Wheal Agar, with which it was later to merge. By 1843 the mine was employing 300 people and its deepest workings were at 90 fathoms (540 ft; 160 m). East Pool was one of the few mines, along with South Crofty, Tincroft, Dolcoath and Wheal Basset and a few others, that were able to survive the depression of the Cornish mining industry in the late 19th century. All these mines were close to one another and pumping water from the workings was still of highest priority: if any of the pumping engines stopped there were serious repercussions at the other mines. Such was the problem of underground water that their winding (whim) engines were adapted to haul water by using self-tipping water-skips—this was done at East Pool in 1897. East Pool mine still had a problem with water coming from Wheal Agar, which was losing money at the time and kept threatening to switch off its pumps, which it did in late 1895. The productive lower levels of East Pool flooded, meaning that it was restricted to reworking its older higher levels. Negotiations between the two mines continued for over a year until, after the intervention of Lord Robartes who owned the Wheal Agar land, East Pool purchased Wheal Agar and all its equipment for £4,000, taking possession on 10 March 1897. In 1913 the mine converted from a company that was run on the cost-book principle to a limited company called East Pool and Agar Ltd. Since the 1860s, the mine had had an extensive ore processing plant located just over a mile to the east in the Red River valley at Tolvaddon, and from 1903 until August 1934 ore was transported there via a mineral tramway which used part of the track of the Camborne and Redruth Tramways, going through Pool village. After the tramway closed in 1934 the ore was carried by an aerial ropeway which ran directly across the countryside to the mill. This was a successful system that continued in use until the closure of the mine in 1945. In 1921 there was a large rockfall underground which destroyed both of the mine's winding shafts and caused flooding, so the next year a new shaft, named Taylor's Shaft after the mine manager, was started. 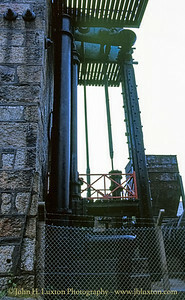 In 1924 a notable 90-inch (2.3 m) pumping engine was installed at this shaft, having been moved from Carn Brea Mine where it had lain unused since 1914. It was known as Harvey's Engine and had been designed by Nicholas Trestrail and built in 1892 by Harvey & Co. 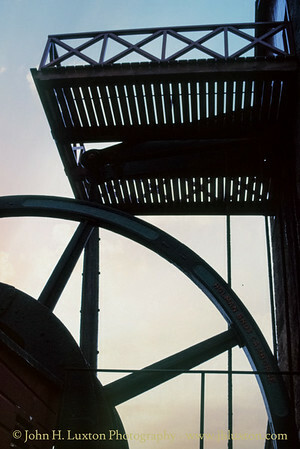 It pumped water from the mine using seven lifts of pumps of 18-and-16-inch (0.46 and 0.41 m) diameter. The 110-foot-tall (34 m) chimney stack for this engine's boilers was completed before the engine house was built. The unique feature of this stack, the vertical letters "EPAL" displayed in white bricks near the top, is still visible. As well as standing for "East Pool and Agar Limited", "EPAL" was also the brand name of the arsenic sold by the company. 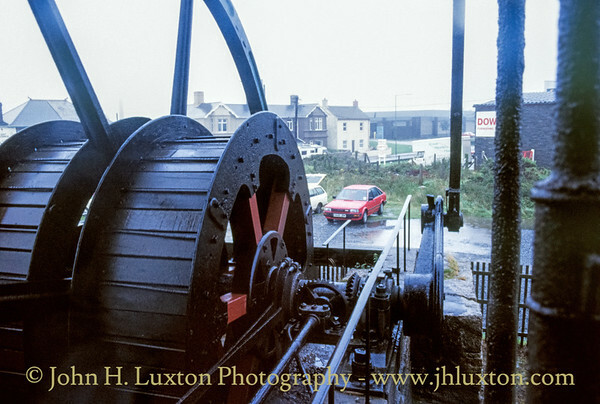 The mine was taken over by its neighbour, South Crofty, and closed in 1945, but Harvey's Engine continued to pump water out of the South Crofty workings until 28 September 1954, when it was replaced by electrical pumps. 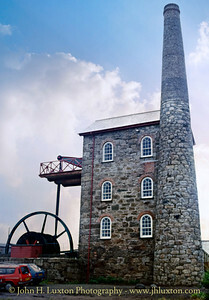 Today, the site is within The Camborne & Redruth Mining District of the Cornwall and West Devon Mining Landscape World Heritage Site, and two beam engines have been preserved here. 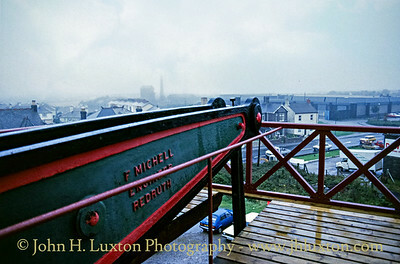 Michell's Shaft Engine House contains the last beam whim engine to be installed in Cornwall. 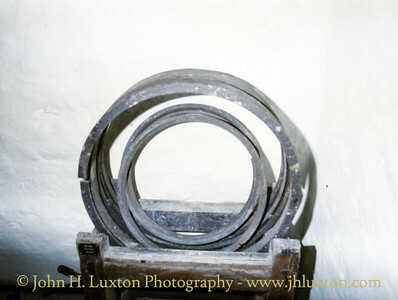 It has a cylinder of 30 inches (0.76 m) diameter and was built in 1887 by Holman Brothers. It cost £675 and was designed to run at 27 strokes per minute and have a winding speed of 1,000 feet per minute (5.1 m/s). 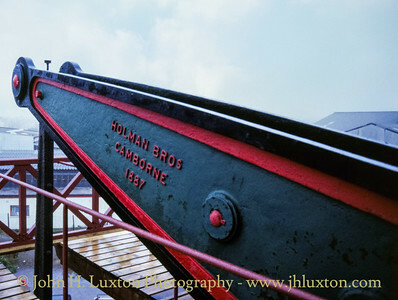 The engine was saved from being scrapped in 1941; it has been in the care of the National Trust since 1967 and since 1975 it has been run under electric power to demonstrate its operation. At Taylor’s Shaft several buildings dating from the 1920s exist. 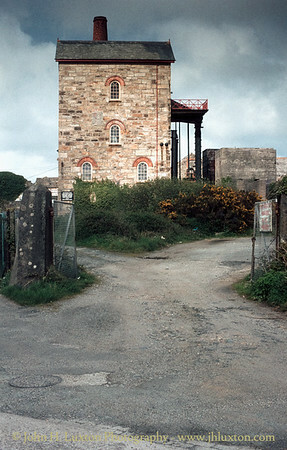 One of these is the engine house still containing the 90-inch (2.3 m) Harvey's Engine, which was saved by the Cornish Engines Preservation Society (later Trevithick Society) through a donation from an American benefactor. View of East Pool and Agar Mine from a distance showing pumping engine house left and whim engine house right. 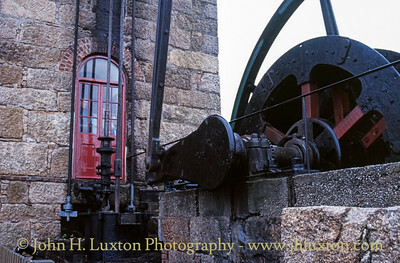 Taylor's Shaft 90-inch pumping engine house. 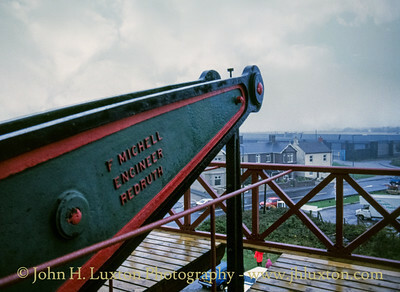 Michell’s Whim (winding engine) was constructed in 1887 by Holman Bros of Camborne and at work until 1921. Since the 1970s the engine has been set in motion for demonstrations by an electric motor. Michell's Whim - engine drivers position. 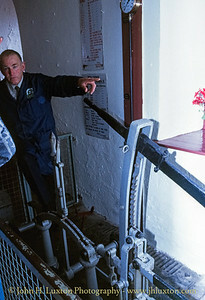 Indicator which showed the position of the gig / cage in the shaft at Michell's Shaft. Michell's Whim Engine - top of the 30 inch cylinder with valve gear. Parallel motion on Michell's 30 inch whim engine. 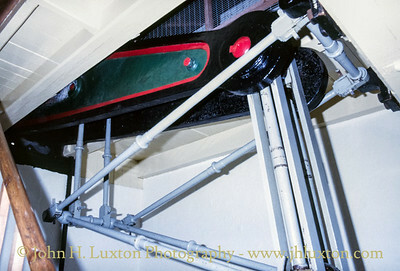 View upwards towards the beam (bob) in Michell's Engine House. 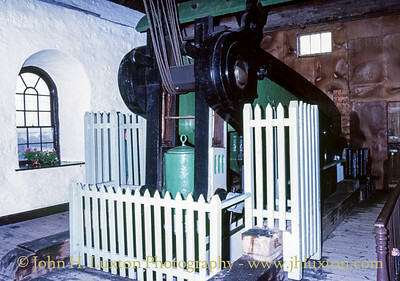 The beam inside Michell's Whim Engine House. 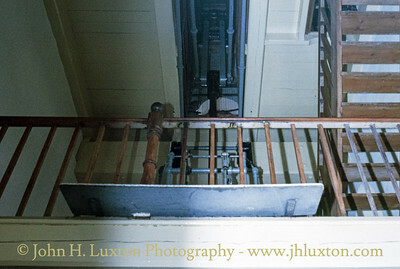 The caging is a modern health and safety feature. Viewonto the "bob plat" showing the out door section of the engine which bears the engineer's name "F Michell Engineer Redruth". 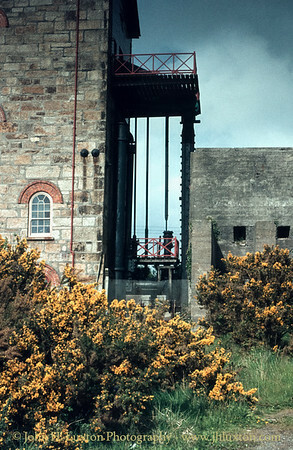 The engine house was named after the mine company's chairman at the time of installation G A Michell. Viewonto the "bob plat" showing the out door section of the engine which bears the engineer's name "F Michell Engineer Redruth". Engine at the top of its stroke. View onto the "bob plat" showing the out door section of the engine the opposite side shows the name of the builder "Holman Bros Camborne 1887"
Spare piston rings for Michell's Whim Engine. 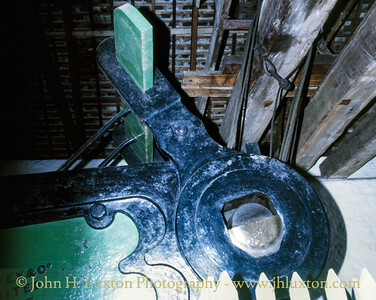 Exterior view showing the crank which transferred the vertical motion into rotary motion for winding. Another view of the crank on Michell's Whim Engine showing the gear wheels which provided drive to the engine valve gear. 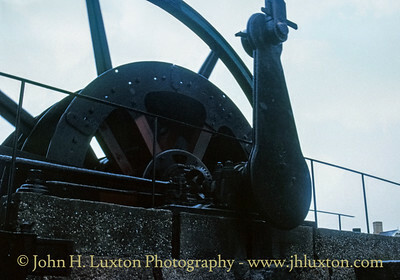 A view of the crank on Michell's Whim Engine showing the gear wheels which provided drive to the engine valve gear. The shaft which was topped by a head stock was located 35 metres away just beyond the red car. Photographs of the mine when operational show that the winding drum was partially enclosed by an open sided shed structure. 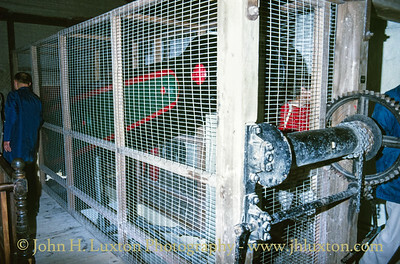 The engine was preserved initially by the Cornish Engine Preservation Society (Now the Trevithick Society) in 1941. Today the engine is in the care of the National Trust. View looking up to the "bob plat"
Another view of the winding drum. The box housed the electric drive motor. In recent years this has been removed and the drive provided more discreetly. 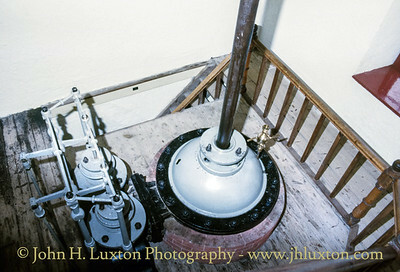 The Shaft Cap at Taylor's Shaft with the pumping rod of Taylor's 90inch engine firmly set in the concrete. At this time the shaft was used for ventilation by South Crofty Mine - part of the ventilation plant can be seen just to the right. Pump rods and rising main of Taylor's 90 inch engine at East Pool and Agar Mine. 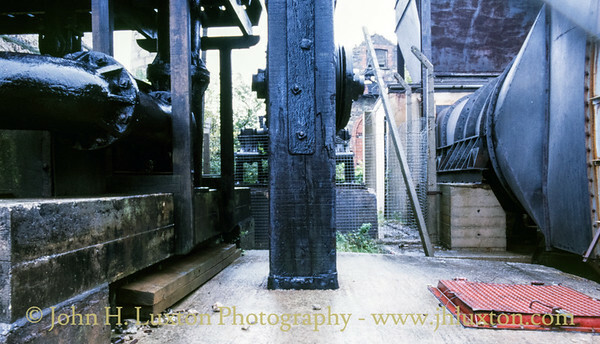 The beam of Taylor's 90 inch Beam Pumping Engine. Note the way the beam (bob0 has been restrained by wire rope fixing it in the outdoor position. The catch wings are shown here - their purpose was to protect the valve gear should the engine over stroke or the pump rod break in the shaft and the engine suddenly be relieved of load. In such an event they would strike the spring beams as the beam came in doors.